Whilst on holiday on the island of Korcula (kor-chew-la) in Croatia, we came across a beautifully rustic, family-run restaurant which served some of the most delicious food I’ve ever tasted. On a sleepy afternoon, we went for a cross country burn on the scooter in search of a famously remote beach, which is renowned for being a heavenly paradise, free from all those irritating tourists. We stopped off in the sleepy little village called Papnat for a squizz at the local country folk (who must have been having a sensible siesta as they were not in sight) and found this gem called ‘Konobe Mate’. Set in the front garden of the family home, grape vines and creepers adorned with bright flowers provided a whimsical setting and welcome respite from the sweltering heat. The endearingly genuine service typical of many in the hospitality trade extended here, as the waitress made polite, inquisitive conversation and praised our selection. On such an intensely scorching afternoon there was only one option – the rose and basil frozen yoghurt, washed down with an espresso and a shot of her finest homemade rakia (house distilled fermented fruit, reminiscent of rocket fuel concocted in days gone by). 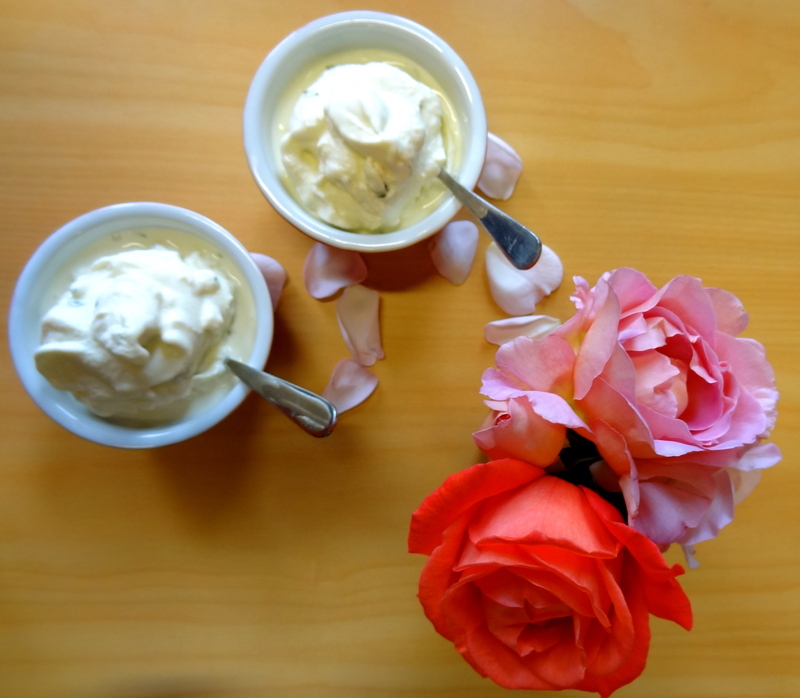 We tucked into delectably icy pillows of this rose and basil frozen yoghurt, a combination that I’d never thought would go well together, but it just works. It’s so fragrant, with intense bursts of floral and herbaceous notes. Put simply, it’s like feasting on a summery garden, only creamy. We were so enchanted with this delightful restaurant, we made a booking for that evening and set off into the blazing sun towards the coast. In order to make this frozen yoghurt you need an ice cream maker, which can easily be purchased at an appliance store or in good condition off Ebay or Trade Me. Ensure that the frozen yoghurt is the perfect consistency by checking it often. I’m usually so captivated by the creation of this frozen yoghurt, I can barely tear myself away from watching it. Am I alone here? Whisk together all of the ingredients for a couple of minutes until the mixture becomes light and fluffy. Transfer to the ice cream maker and follow the user instructions until the desired consistency is reached. In the ice cream maker I use, it took about 35 minutes until lusciously textured frozen yoghurt was created. Best eaten as soon as possible.